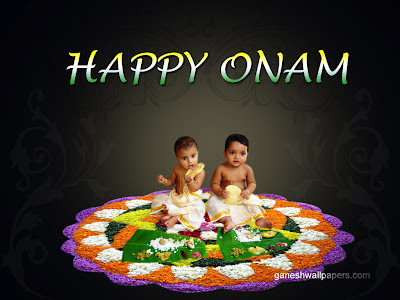 Onam, ഓണം, is a festival celebrated by the people of Kerala, India. The festival commemorates the Vamana avatar of Vishnu and the subsequent homecoming of the legendary Emperor Mahabali. 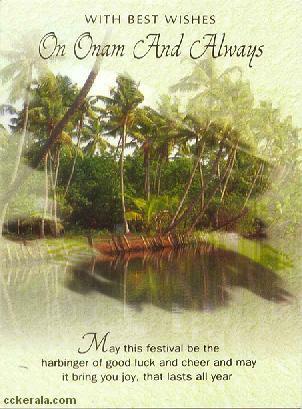 It is the state festival of Kerala and falls during the month of Chingam, August – September, and lasts for ten days. The festival is marked by various festivities, including intricate flower carpets, elaborate banquet lunches, snake boat races, Onappottan, Kaazhchakkula in Guruvayoor, Puli Kali, Kaikottikkali etc. Mahabali was the grandson of Prahlada, son of Hiranyakashyapa who was slain by Vishnu in his Narasimha Avatara. Prahlad, despite being an Asura, had great faith in Vishnu. Mahabali learned the act of love and devotion to Lord Vishnu as a child, from Prahlada. By traditional beliefs; Parasurama, an incarnation of Vishnu is credited to have founded Kerala. An alternate legend defines Onam as the day on which Parasurama recovered Kerala from the sea-bed by throwing his battle-axe. The axe traveled from Gokarnam in the North to Kanyakumari in the South. This legend is mentioned by Hermann Gundert in his Malayalam Dictionary. Onam comes in the month of "Chingam" which is the first month according to the Malayalam Calendar. People put flower mats in front of their houses, to welcome King Mahabali. There will be competition for the laying of flower mats; Keralites all over the world will be celebrating this ten days with pomp and gaiety. They wear new dresses, visit as many temples as they can, perform dances like Thiruvadhira kali Thumbi Tullal etc. to name a few. The most important things about Onam are the onakkodi, the new clothes worn on this day and onam sadya, a feast which is quite elaborate. This is usually a feast served on banana leaves and serves rice along with at least an array of 4 dishes. Traditional pickles and papadam are also served. Dessert is usually 'payasam', a sweet dish made of milk, sugar and other traditional Indian savories. 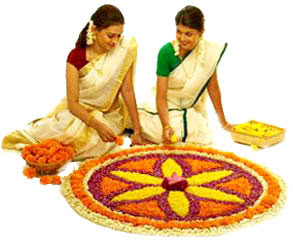 Onam is an ancient festival which still survives in modern times. 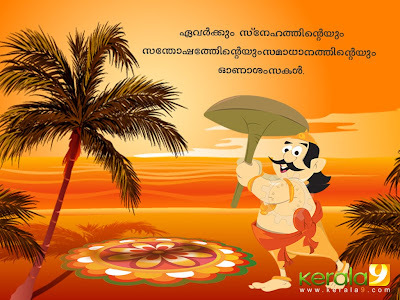 Kerala's rice harvest festival and the Festival of Rain Flowers, which fall on the Malayalam month of Chingam, celebrates the Asura King Mahabali's annual visit from Patala, the underworld. Onam is unique since Mahabali has been revered by the people of Kerala since prehistory and is celebrated by people irrespective of religion. According to the legend, Kerala witnessed its golden era during the reign of King Mahabali. The Brahma-Vaivarta Puranam explains that Lord Vishnu wanted to curb the pride of Indra; and therefore positioned Mahabali in great power. The Bhagavata Purana reads "Vishnu will take the kingdom away from Purandara, Lord Indra, and give it to Bali Maharaja." The subjects under Mahabli's reign was happy and prosperous and the king was highly regarded, so much so that even the gods under Indra became jealous of Mahabali as was intened by Vishnu, and they approached Vishnu claiming that Mahabali is now equivalent to an Indra. Once Vishnu was assured that Indra's pride has been contained and that a world with two Indras represents imbalance, Vishnu assumed the form of a dwarf: Vamana. Vamana requested three steps of land for him to live in. Given a promise of three steps of land by King Mahabali against the warning given by his Guru Sukracharya, Vamana, enlarged himself to such dimensions as to stride over the three worlds. He had grown so huge that he could step from heaven to earth, and earth to the lower worlds in two simple steps. King Mahabali unable to fulfill the promise of three paces of land to the Supreme God, offers his head for the third step. Thus, Vamana places his foot on King Mahabali's head and sends him down to the netherworld. Being worshipped however, by Mahabali, and his ancestor Prahláda, he conceded to them the sovereignty of Pátála, netherworld. However, as Mahabali was equivalent to Indra, he had to wait until the next Yuga where he would be the Indra. In the meantime, with the grace of Vishnu, Mahabali visited his people on an annual basis. Vishnu served Mahabali as a gatekeeper in Patala as the Lord himself serves his greatest devotees. It is this visit of Mahabali that is celebrated as Onam every year. People celebrate the festival in a grand way and impress upon their dear King that they are happy and wish him well. The rich cultural heritage of Kerala comes out in its best form and spirit during the ten-day festival. The central feature of Onam is the grand feast called Onasadya, prepared on Thiruonam. It is a nine-course meal consisting of 11 to 13 essential dishes. Onasadya is served on banana leaves and people sit on a mat laid on the floor to have the meal. Another popular feature of Onam is Vallamkali, the Snake Boat Race, held on the Pamba River, in which decorative boats oared by hundreds of boatmen race amidst chanting of songs and cheering by spectators and viewers. There is also a tradition to play games, collectively called Onakalikal, on Onam. Men go in for rigorous sports like Talappanthukali, played with a ball, Ambeyyal (Archery), Kutukutu and combats called Kayyankali and Attakalam. Women indulge in cultural activities. 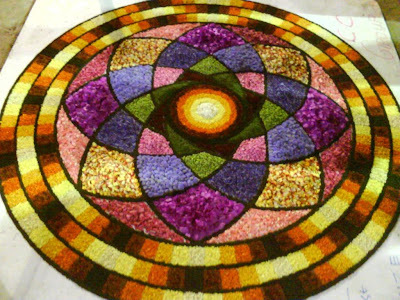 They make intricately designed flower mats called, Pookalam in the front courtyard of the house to welcome King Mahabali. Kaikotti kali and Thumbi Thullal are two dances performed by women on Onam. Folk performances like Kummatti kali and Pulikali add to the zest of celebrations. Mahabali's rule is considered the golden era of Kerala. The following song is often sung over Onam: “ Maveli nadu vaneedum kalam, manusharellarum onnupole amodhathode vasikkum kalam apathangarkkumottillathanum kallavum illa chathiyumilla ellolamilla polivachanam kallapparayum cherunazhiyum kallatharangal mattonnumilla adhikal vyadhikalonnumilla balamaranangal kelppanilla"